1 "Good day, children. Welcome back to our show. This morning we are going to interview a real live mermaid! She's not really a mermaid. She is a manatee. People used to think manatees were mermaids, though. Manatees live in shallow, marshy areas and rivers in Florida, the Caribbean Sea, the Gulf of Mexico, the Amazon, and West Africa. We know more about the Florida manatees than the other kinds. 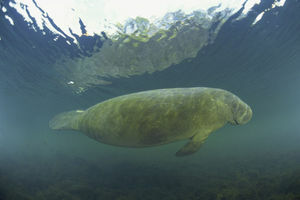 Children, this is Sirenia, a Florida manatee. Hello, Sirenia." 2 "Hello, Keith. Hello, children." 3 "Sirenia is an interesting name. How did you get that name?" 4 "Mermaids were once called sirens, Keith." 5 "That is interesting. You can live up to 60 years. That's a long time. Why are you endangered?" 6 "It is for the same reason every place we live, Keith. Humans are careless. They hit us with their boats. We get all cut up from the propellers." 7 "That is terrible, Sirenia. How many manatees are there in Florida?" 8 "There are about 1,000 of us left, I think. It is very hard to count manatees." 9 "Tell the children a little about yourself."